COREFAIT COST-BENEFIT ANALYSIS MODEL is professional extension of COREFAIT FINANCIAL ANALYSIS MODEL. 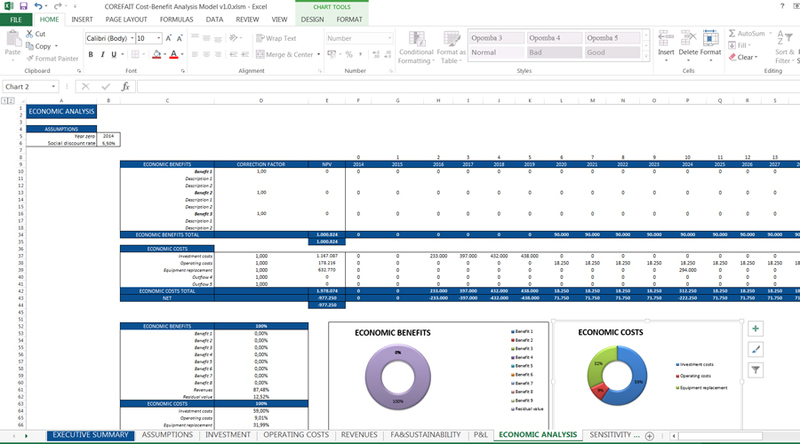 It includes three additional sheets (Economic, Sensitivity and Risk Analysis). Economic Analysis is essential part of COREFAIT COST-BENEFIT ANALYSIS MODEL. It assesses the project’s contribution to the economic welfare of the country or territory in which it is implemented. It is observed from the standpoint of the whole society, as opposed to a financial analysis, which looks at investment from the viewpoint of the owners or investors in infrastructure. The purpose of the economic analysis is to demonstrate that the project has a positive net contribution to society and should be funded. The benefits of the project should be greater than the cost of the project, which should be visible from the economic net present value (ENPV), benefit-cost ratio (B/C) and economic internal rate of return (ERR). ENPV must be greater than zero, B/C ration must be greater than one while ERR must be greater than economic discount rate used to calculate ENPV. In economic analysis it is important to take into account possible negative economic effects project can have due to its implementation. 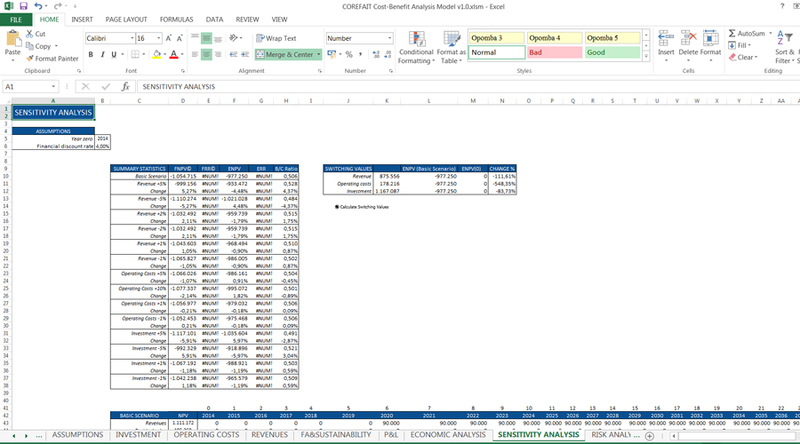 Sensitivity analysis as integral part of COREFAIT COST-BENEFIT ANALYSIS MODEL determines which are the critical variables for the project. Through sensitivity analysis we look at how changes in certain variables of the project (the investment amount, revenues, operating costs etc.) affect the financial and economic indicators. Critical variables are considered to be those in which a change of +/- 1% effect on the net present value of 5% (different benchmarks can be established). It is also useful to calculate the percentage changes (switching values) in certain variables where the financial or economic net present value goes back to zero (as the point at which the project is no more additional financial or economic added value). 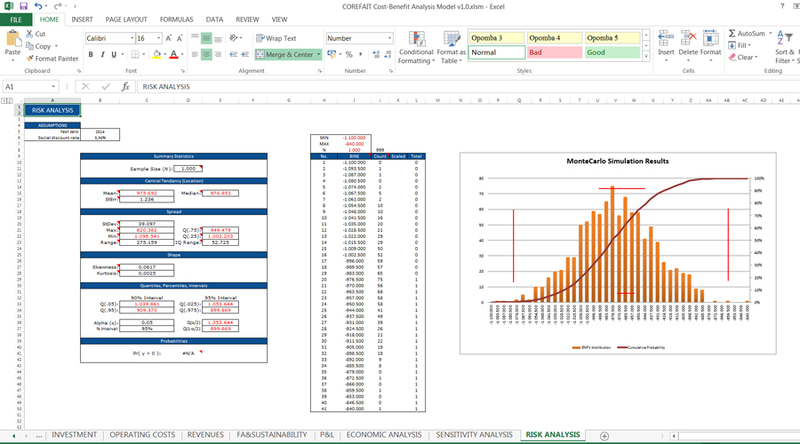 Final step in COREFAIT COST-BENEFIT ANALYSIS MODEL is Risk analysis. Risk Analysis is a technique used to identify and assess factors that may jeopardize the success of a project or achieving a goal. When there are available data on similar projects or the probability distribution of certain critical variables it is recommended to calculate the distribution of financial and economic indicators depending on changes in critical variables and calculate the expected values, standard deviation, median and probability of occurrence. In the absence of quantifiable data risk analysis can be qualitative. Risks can be identified, assess their likelihood of emergence and impact and devise ways to prevent or alleviate them.